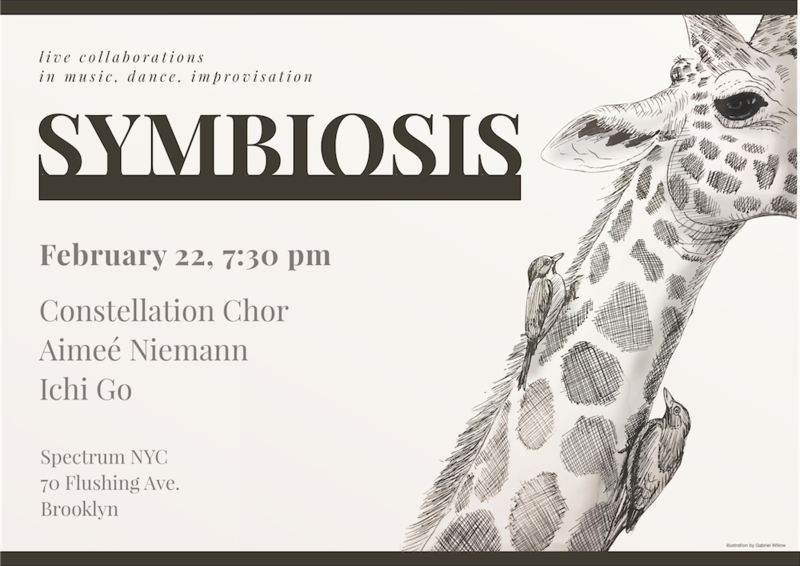 Symbiosis kicks off on February 22nd at 7:30pm with improvising vocal ensemble Constellation Chor, and a fresh collaboration between violinist and composer Aimeé Niemann and dancer Ichi Go. Symbiosis, curated by Sarah Chien and Caitlin Cawley, is a new series at Spectrum celebrating music, dance and improvisation. We’ve put together three nights of live music and dance that honors the humanity and agency of all of the performers, and interrogates the boundaries between both genres. Each night of the series includes a “blind date” between two solo performers who create a new improvised work, and a group that has an established practice combining these two forms. The other star of the show is Sarah’s homemade dance floor, which we’ll be installing in the middle of Spectrum, transforming it into a unique environment for movement. Spectrum has no advance ticket sales; tickets are available at the door. All events are $15 general / $10 student/senior unless otherwise noted.